Choosing the right school is arguably more important than the decision you will one day make regarding which college your child should attend. Providing them the best environment for organizing their developing minds, learning how to learn, and discovering the sheer joy of learning, will pay dividends throughout their lives. All children aged 3 months to 6 years regardless of race, national origin, and religion are eligible for enrollment. A Director - Parents interview will be conducted to exchange information relative to the child's welfare. Application, medical clearance, and registration forms are to be completed. * Peruse this website to determine whether our philosophy and methodology meshes with your wishes for your child's fundamental mental exercises and mind-building activities. Keep in mind that we will be helping them learn how to think, not what to think. We empower their young minds to learn to think rationally and critically for themselves, and leave indoctrination in belief systems and dogma to parents and other surrogates. * Review carefully the policies and procedures available in the "Parent Handbook." It is most important to understand that we are a school, not a daycare facility. We have a rigid schedule that does not appreciate being disrupted. Our fees are tuition based, and not related to actual attendance. Most of the seemingly excessive minute detail in our policies and procedures was developed for parents experiencing difficulty transitioning out of a daycare paradigm. Once understood, interaction between parents and our staff is generally quite pleasant. * Call the office at (949) 364 6342 for an appointment to tour our facility. We prefer to make these appointments around 10:00 AM. This is the best time to observe our students working in the Montessori environment; and if you have never seen a "normalized" class of Montessori children in an authentic Montessori school, you are in for a real treat. If those hours are impossible, we will try to accommodate your schedule. You are strongly encouraged not to bring children for this first tour. * Although many are anxious to sign up immediately, subsequent visits are usually in order for the approval of spouse, child, and occasionally sponsoring grandparents. The best time to first introduce a child to our facility is at noon or after 3:00 PM, when the children are on the playground. Our playground catches their eye anyway, and it is even more attractive when populated with joyous children burning off energy. 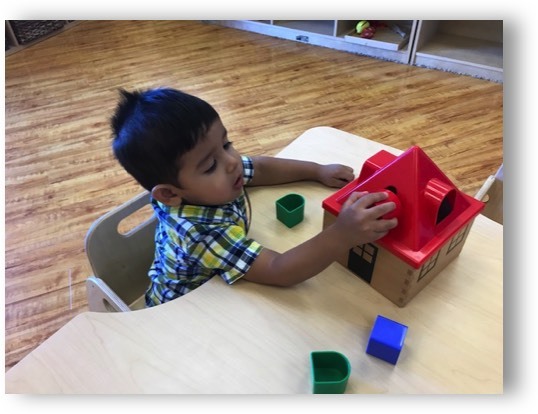 We can then introduce them to the Montessori classroom environment when it is empty and they will not distract or be distracted by other children doing their work. * Finally, comes the "Paperwork Blizzard" to fill out all the internal and Department of Social Services (DSS) forms required to enroll your child and/or get them on the waiting list. The forms can be printed from this website, but we can also provide them during your visit. This will be the least enjoyable part of the process; but we will be happy to fill out some of them for you, and assist in filling out the rest. If you have made it this far, thank you for your time and interest.